First up – Drambuie, the scotch whisky liqueur was first sold in Broadford! The story goes that after the Jacobites were defeated at Culloden in 1746, their leader, Bonnie Prince Charlie, was pursued by government troops to the Isle of Skye. From Skye he was helped to escape from the British Isles for good by the Clan MacKinnon. In return for their help, Charlie passed on the recipe for his own secret liqueur to the clan chief. Over 100 years later, John Ross of the Broadford Hotel persuaded the MacKinnons to let him sell a batch of the liqueur. Evidence suggests that it was a success, with locals naming it dram buidheach, which translates from Gaelic as ‘the drink that satisfies’. John’s son James trademarked the name Drambuie in 1893 and his widow took the recipe to Edinburgh where commercial production began in 1909. 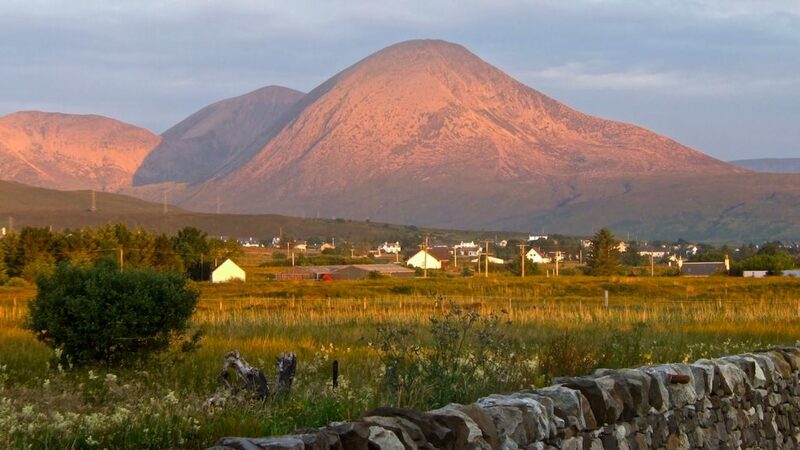 As you head out of Broadford and walk along Strath Suardal, the hill that dominates to the north of the valley is Beinn na Caillich, or the hill of the old woman. It is rumoured that a Norwegian Princess was buried on the summit so that she could feel the winds from Norway! The strath itself is unusual in Scotland, being one of the few places where limestone is found. This rock is easily eroded by rainwater, readily forming cave networks. Indeed, at the foot of Beinn na Caillich, near the hamlet of Kilbride (meaning the ‘Holy Place of Bride’), is High Pasture Cave, which was rediscovered by cavers in 1972. It is the second longest cave network on Skye and has undergone significant excavations in recent years. Archeologists have uncovered human remains and a fragment from what is believed to be the first stringed instrument in Europe. It is thought the cave was used as a site for both domestic activity and rituals until around 100AD. In 2015, the site was used for a contemporary arts performance presented by Skye-based Atlas Arts and performed by artist Hannah Tuulikki. The event took place at sunset on Samhain, a gaelic festival marking the end of harvest season and the start of the winter when myth has it that the celtic goddess Bride does battle with Cailleach, the dark-ruler of winter! The next section of the trial takes you into a part of the island with an entirely different geology. The central part of Skye was formed from volcanic activity around 60 million years ago. The trail passes through the mountains with the range to the west of the trail known as the Black Cuillin and the range to the east known as the Red Cuillin. The Black Cuillin (often just called ‘The Cuillin’) is a high mountain ridge and to traverse the entire ridge is one of the UK’s classic mountaineering challenges. The peaks we can see today are the eroded remains of a magma chamber and it is thought that a volcanic eruption on the island significantly changed the Earth’s climate. The eruption has been dated to 56 million years ago and is thought to have been similar in scale to that at Krakatau in 1883. The greenhouse gases left in the atmosphere after the event contributed to a climate disturbance which raised global temperatures by 8°C. At the end of Day 4 on the trail, after a walk up the wild and remote Glen Sligachan, relative civilization is reached at the Sligachan Hotel, where Seumus’s Bar offers a welcome place to rest weary legs at the end of a long days walking. Local ale’s brewed on site are available and there is a selection of over 400 Malt whiskies to choose from! The current hotel dates back to 1830 and was a hub for mountaineering development in the Victorian era with the nearby village of Sconser being the birthplace of Britain’s first mountain guide of alpine standard, John Mackenzie. Mackenzie reputedly led over a thousand trips into the Cuillin without a single accident and is famous for his climbing partnership with the English scholar Norman Collie. 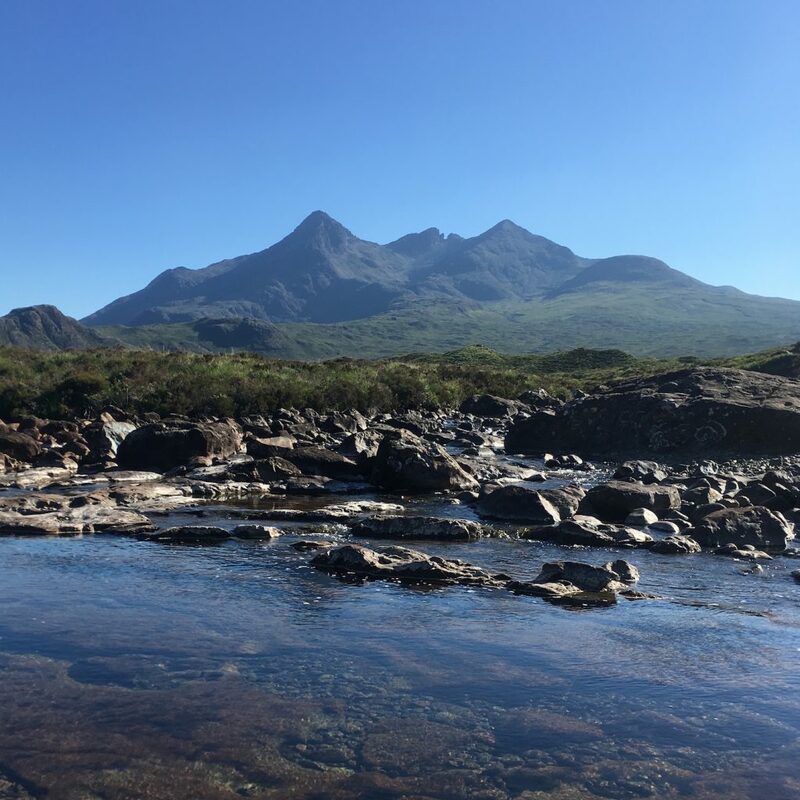 Together the two mountaineers explored large sections of the Cuillin Ridge and their achievements in the mountains have been recognised by having two of the local peaks names after them (Sgurr Thormaid – Norman’s Peak – and Sgurr Mhic Choinnich – Mackenzie’s Peak). Work is also underway to build a statue commemorating the two climbers at Sligachan and a small climbing museum can be found in the hotel with some particularly good pictures from that era of exploration in the Cuillin. Heading north the next stopping point is Portree, the main town on Skye. Atlas Arts are based here, and, going back to the Jacobite uprising, it is thought that Macnab’s Inn in the town centre was the final meeting place of Bonnie Prince Charlie and Flora MacDonald. From Portree the route of the trail follows the crest of the Trotternish Ridge, one of the best sections of the whole route. The scenery here, which includes the amazing sculpted rock features of the Storr and the Quirang, is iconic of Skye and these are amongst the most photographed scenes in Scotland. However, what is less well known is that this is actually the site of Britain’s biggest landslide! The landslide also has its origins in the volcanic history of the Island. 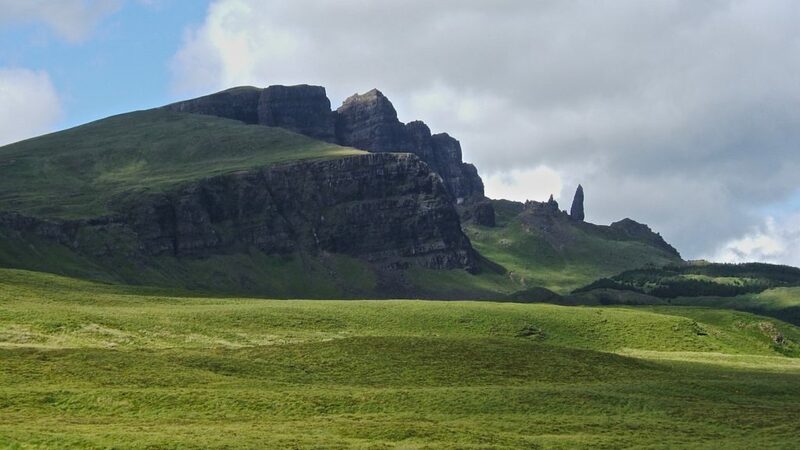 The hills of the Trotternish Ridge are formed from ancient basalt lava flows resting on top of a base layer of softer sedimentary rocks from the Jurassic period (when Skye was a tropical lagoon and dinosaurs roamed the Earth – in fact dinosaur footprints have been found in this bed of rock nearby!). About 50 million years ago, movements in the Earth’s crust caused the whole area to rotate and tilted the rocks so that they now point up to the east. Gravity has since done the rest, causing the heavier rocks of the lava flows to slide down the mountainside. The subsidence continues today at a very slow pace, but don’t worry, the process is so slow that it is not going to affect your visit! Finally, at the northern tip of Skye, near walks end at Kilmaluag, is the Lookout Bothy – probably the only bothy where you can watch whales and dolphins without even going outside. This bothy is a former coastguard watch station, built in 1928. It was operational until the 1970’s and has subsequently been taken on by the Mountain Bothies Association. It is known for the 180-degree panorama from the large bay window at the front of the bothy and on a clear day the views stretch from the Western Isles to Cape Wrath. There’s even a pair of binoculars in situ for watching the wildlife! So, from geological events in deep historical time, through the Jacobite uprising to 21st century contemporary art, there is lots of interest along the Skye Trail. If anything though, I’ve only just scratched the surface. Its worth taking your time on Skye and getting to know the stories and events that make the place what it is today. Why not give the trail a go and do just that. 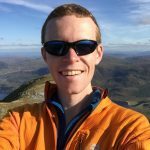 John King is a qualified ML, passionate about passing on his knowledge and skills, and sharing his enthusiasm for the hills with others. He first developed his love of the outdoors in the Scottish Highlands and has explored many of the wilder and more remote corners of the Highlands, in all seasons. He has built up an intimate knowledge of the Scottish hills and glens as well as a keen interest in the ecology, geology and history of the natural environment. He also enjoys getting his hands on rock and has completed many of the UK’s classic scrambles and is a keen rock climber.